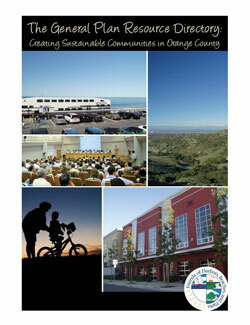 “The General Plan Resource Directory: Creating Sustainable Communities in Orange County” was released in December 2011. The Resource Directory includes relevant and timely information on sustainable policies that reduce greenhouse gas emissions, reduce vehicle miles traveled, create convenient and vibrant communities, and ensure our natural resources are protected. All of Orange County’s 34 cities plus the County were evaluated, with the exception of cities that were undergoing a General Plan update. This research was to determine the existing innovative and sustainable policies already adopted. Though geared for decision and policy makers, this document will also help the public understand General Plans, their role in the process, and how new laws impact the decisions their city leaders are making.